With the first week of Lent under my belt, I’ve decided I finally found a fasting regimen that’s working for me – at least so far, which is longer than most of my past sacrificial attempts. This year I decided to give up something that will benefit not only myself but those around me; namely, talking. I heard something recently that prompted this decision. 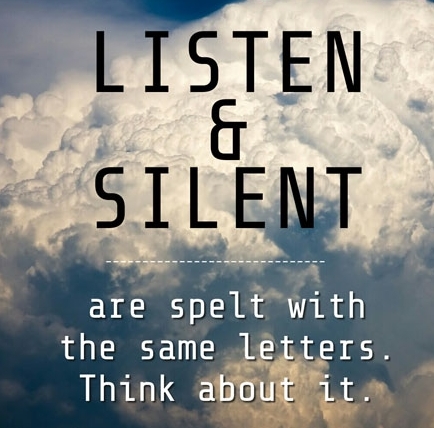 It was an observation that silent and listen contain the same letters. I never noticed. Could it be because you can’t do one without the other? What better time to “be still and know that I am God?” (Psalm 46:10) Lent is meant to emulate Jesus’ time in the wilderness, and He wasn’t doing a lot of talking. It was a time of testing, encounter and renewal. He was completely immersed in the presence of His father listening for strength, guidance and encouragement. It was preparation for the mission before Him. As I contemplated this effort, I thought of an acronym a friend taught me years ago in regard to parenting. The acronym is W.A.I.T. – Why Am I still Talking? Could it be because I don’t want to hear what the other person is saying, or do I just like the sound of my own voice? I wasn’t very successful applying her wisdom in my parenting, but found it extremely effective in my spirituality when I chose to exercise it. God wants us to get to know Him. We can only do this by sitting quietly in His presence and allowing Him to reveal His character and His will. There’s a good reason He gave us two ears and only one mouth. My biggest challenge is quieting the incessant chatter in my head despite my best efforts to silence it. It creates relentless lists. Some of them may sound familiar; namely, the to do list, the shoulda/woulda/coulda list, the resentments list, the grievances list, the what-if list, the worry list, the fear list, and my personal favorite: the self-flagellation list. They are rarely positive, but every now and then one sneaks in only to be distorted to a pride list. It’s a vicious cycle. Buddhists refer to it as monkeymind. “The Buddha held that the human mind is filled with drunken monkeys flinging themselves from tree branches, jumping around, and chattering nonstop. He meant that our minds are in constant motion.” It’s an ongoing struggle to mute them in order to hear the still small voice that I yearn to hear. I have to constantly reel my mind back into the present moment and the conversation at hand. It’s no mystery as to who’s the author of these distractions. He’s known as the Master of Distraction and will use anything to divert us from God’s purpose if we choose to let him. My personal defense against monkey mind is to rely on the following scriptures. How do you choose to battle monkeymind? Older PostLet the Good Times Roll!